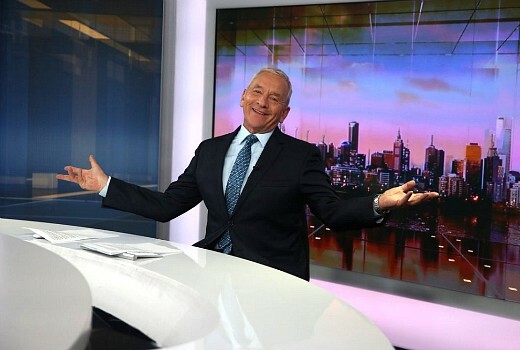 Ian Henderson’s farewell Victorian bulletin, capping off almost 4 decades at the public broadcaster was plagued by technical problems last night which resulted in viewers thrown to the New South Wales edition half way through. Things began going wrong with the wrong images, screens freezing and an autocue fail. Henderson, and loyal viewers, were denied his farewell message, prompting them to take to social media to vent. Where’s #hendo ???? Surely it can’t finish like this, after almost four decades? The tech problems continued into the night with The World replaced with a Sydney bulletin, as was the 11pm news, usually presented from Melbourne. Only last week News Breakfast was late to air due to similar technical problems. ABC assured viewers ‘Hendo’ would still bid them farewell, tonight. An unexpected technical fault during ABC News Victoria’s 7pm bulletin on Thursday night forced an unavoidable switch to a back-up transmission from ABC NSW. That is such a great photo, really sums it up. I grew up watching Hendo – always so calm. Watching the final one now streaming it and sad to think it’s the end. Congrats on a great remarkable career and being in my house from a young kid, bratty teen and to a young adult. Such a shame on Hendo’s last night and very embarrassing for everyone involved. Before automation, had a fully staffed control room been there it still would have gone to air manually with viewers hardly noticing there was a problem. Now, when computer says No, it refuses to budge. The technology to put it to air manually is still in the control room. Maybe they should teach the kids in charge now how to operate it as a back up. Just saying. I feel sorry for Hendo. Not only was he not afforded the proper opportunity to say goodbye but let’s not forget that the poor man had to endure the most excruciating period when the ABC News automation system was first introduced and left him stranded at the desk time after time each night without a story rolling or nothing happening at all. One night, only every second story made it to air. He is a consumate professional and I am so glad he will get another chance to sign off. Best wishes Hendo. “An unexpected technical fault”. Say that again? Was this the same “unexpected technical fault” that delayed Breakfast earlier in the week? And aren’t all crashes “unexpected”?